Most transmission chains are sold in standard lengths, usually 3,048 mm (10 ft). The length may vary, depending on the size of the chain. 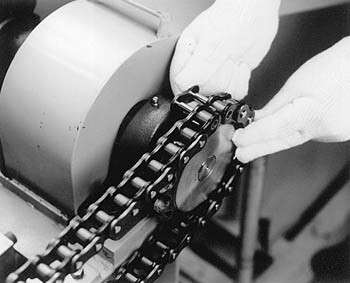 Small pitch conveyor chains may be special ordered in lengths of chain as required. The first thing you must do is cut the chain to the length you need. Tools: Angle grinder (to cut the riveted parts), chain vise, punch, hammer, chain screw. Step 1. Grind the riveted portion of the two pins with the angle grinder. If the chain has cottered pins, remove them. Step 2. Secure the chain in the chain vise. Using the primary punch and the secondary punch (or the chain screw), remove one set of pins. Step 3. Install both ends of the chain onto sprockets and join with connecting links (Figure 7.1.) Be sure to install the clips or cotter pins as shown in Figures 7.2 and 7.3.